With attractive yellow flowers, and a winter to spring flowering time Kerria japonica makes a useful addition to the garden. This is the only species in the genus, and this is a shrub like plant is fast growing and best used in positions where its early flowering nature can be appreciated. 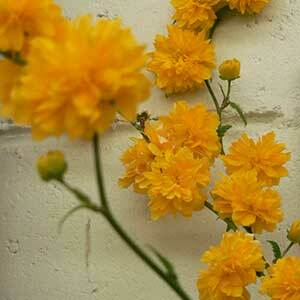 Origins are in China although Kerria japonica ‘pleniflora’ is commonly called the Japanese Kerria. This variety has attractive double flowers, like little pom poms. Two varieties are available, Kerria japonica ‘pleniflora’ withits double flowers, and a very attractive (as well as rare) single flowering variety. Both varieties can be used as cut flowers, simply prune away a section and you have a colourful display. This is not a demanding plant, a sunny position and a well drained humus rich soil and it will thrive. It does have a tendency to sucker, however this is easily controlled. Pruning is the only real maintenance required, and this is essential as the plant flowers on new growth. If you leave unpruned it tends to look stray and is less floriferous. Prune immediately after flowering to maintain size and shape. Neglected specimens can easily be pruned back to around 30 cms above ground level, again, just after flowering.